One of the oldest cities of Central Asia is Khiva. It is located on the north-western part of Uzbekistan, in a large agricultural oasis of Khorezm. 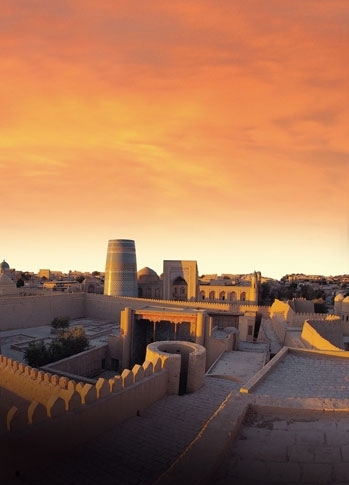 Khiva was firstly mentioned in the X century. In the XVII - beginning of the XIX century Khiva was the capital of Khiva Khanate and an important center of cultural life. In this vast architectural reserve numerous mosques, mausoleums, madrassah remained in a good condition. The most notable sights are: Kunya-Ark citadel, the remains of the palace Tash Hauli, the mausoleum of Pahlavan Makhmud (XVII c.), madrassah of the ruler Allakulikhan, Islam Khoja Minaret and other monuments of antiquity. 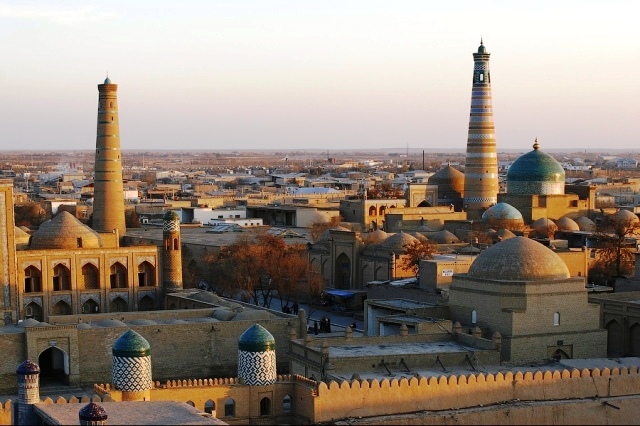 Khiva is a center of modern handicraft and art industry. It is famous for its carvers in wood and stone, jewelers, engravers and carpet makers. 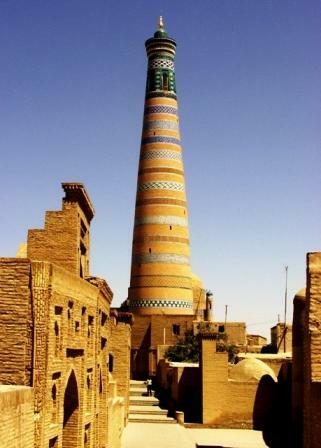 Most of the architectural masterpieces of Khiva is concentrated in its urban centre – in Ichan-Kala. It is "the city within a city" surrounded by strong fortified walls, in which there are four gates – from the four winds. From the western gate to the east one the main road was laid, along this road the main monumental structures are located. Ichan-Kala is visible from the observation tower Ak-Sheikh-bobo as clear as daylight. The unusual silhouette of the minaret Kalta Minar, as if cut to the middle draws its attention. His massive trunk, exquisitely decorated with wide and narrow belts of glazed bricks, indicates to the fact, that it was suggested as a grand, immense building, the main line of the city. But the minaret remained unfinished after the death of the ruler, under whom it was being constructed. It received the name Kalta, which means “short”. Mukhammad Amin Khan madrassah, the largest of the surviving buildings of higher theological educational establishments is very close to Kalta Minar. The peculiarities of its architecture are dual khudjras – cells for residence of the students. The buildings are remarkably decorated with the belts of colored brick kits and majolica revetment. On the territory of Kunya Ark - Old fortress - the palace of Muhammad Rahimkhan, with a rich and unusual décor of inner decoration, is located. The walls of the hall are trimmed with the pottery carving with the colouring. The neighboring two-storied building is a harem. There are a lot of rich halls and living rooms. Juma Mosque (X century, 1788) is amazing. The dating of the building- 1778-1782 years, is preserved at the entrance door of the mosque. But 210 pillars of the mosque, supporting the roof, are much older -XII - XV centuries. They were brought here from other ancient buildings. The columns are wonderfully well-composed, and have rich ornamental carvings. Kurnysh Khan Palace was intended for the magnificent receptions. Once there was a wooden throne in the throne hall. It was decorated with the embossment in silver on a red background. The building has a great avian (summer terrace) with columns. The palace is also notable for the rich majolica revetment walls with the intricate ornaments. The memorial complex of Pakhlavan-Mahmud was built in memory of the revered poet of Khiva, who was canonized as the patron saint of the city after his death. Near the complex there is a minaret of Islam Khoja, 45-meters high, which is crowned with a through light with a dome on the top. In the outer part of the city, called Dishan-Kala there are also many old monuments.